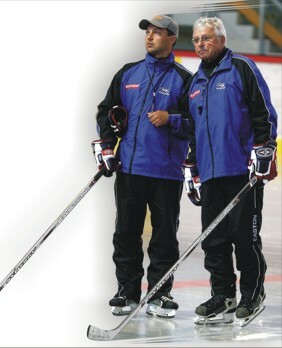 LUDEK BUKAC (right) with his son, LUDEK JR. (left); the father and son have operated a highly successful youth hockey school in the Czech Republic since 1991. LUDEK BUKAC’s charges nearly collected Canada’s scalp in the quarterfinals at the 1992 Winter Olympic in France. In the historic shoot-out after overtime, the Germans literally fell inches short. Nevertheless, the Czechoslovak coach made Olympic history at the Albertville Games, anyway. Bukac became the first man to coach the ice hockey teams of three different countries at the Winter Olympics. The former international led his native Czechoslovakia to the silver medal at Sarajevo in 1984 and guided Austria at the Calgary Games four years later. Bukac, who was behind the bench at two Olympics for Germany, was later the national team coach of the Czech Republic. Bukac never played for Czechoslovakia at the Winter Games but did skate at the IIHF World Championships in 1961 and 1963. Upon retirement as a player, Bukac went into coaching and served as an assistant for the Oklahoma City Blazers of the old Central Hockey League for the 1965-66 season; the Blazers were a farm club for the National Hockey League’s Boston Bruins. The next year, the former Sparta Prague forward found himself in the Soviet Union on the staff of all-powerful army club, CSKA Moscow. Bukac then returned home and spent the next thirteen seasons working in the Czechoslovak elite league for Sparta Prague, VSZ Kosice and Motor Ceske Budejovice. 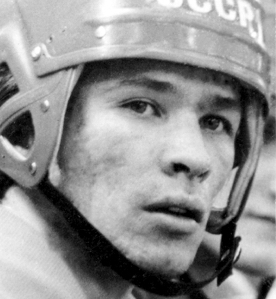 Bukac was appointed the coach of Czechoslovakia’s national team to start the 1980-81 campaign after serving as an assistant for the squad at the Lake Placid Games the previous winter. The well-traveled coach can claim two titles at the IIHF World Champinships on his resume — one for Czechoslovakia in 1985 and another for the Czech Republic in 1996. Germany's PETER DRAISAITL (20) tangles with FABIAN JOSEPH (8) of Canada at the 1992 Winter Olympic Games in Albertville, France. Canada narrowly defeated Germany after overtime and a penalty-shot shootout. The nation of GERMANY was occupied by the conquering Allied armies and, ultimately, split in two as a result of the Second World War. In November of 1989, the symbolic fall of the BERLIN WALL led directly to the destruction of the German Democratic Republic. This, in turn, resulted in the first entry of a true unified German team at the 1992 Winter Olympics for the first time in 56 years. Ironically, the newly unified Germans under the Czechoslovak coach LUDEK BUKAC at the Albertville Games contained no players from the former East German national team, however. East Germany had last appeared at the A Pool of the IIHF World Championships in 1985 at Prague. Long prior to that, the sport of ice hockey had been de-emphasized and de-funded by officials in the GDR in favor of other athletics. The best of example of this policy was the East German elite league itself, which contained exactly two teams. In the spring of 1991, exactly two GDR national team players — goalie RENE BIELKE and forward MARIO NASTER — were picked to represent the newly re-unified Germany at the annual IIHF World Championships. Only five former East German national team players ever went on to appear for re-united Germany at a major international event. Two former GDR internationals, defenseman TORSTEN KIENASS and JORG HANDRICK, would wear the colors for Germany at the 1994 Winter Olympic Games in Lillehammer, Norway. Canada's JOE JUNEAU (9) does not appear to be too excited about the set of silver medals, one of which the Boston Bruins' draft pick is due at the 1992 Winter Olympic Games in Albertville, France. … and the overwhelming majority of its elite hockey players had already found gainful employment in the West, many with National Hockey League clubs. CANADA, meanwhile, had put together a formidable squad which included veterans with considerable NHL experience such as defenseman CURT GILES as well as forwards DAVE HANNAN and DAVE TIPPETT. SEAN BURKE, Canada’s goaltender at Calgary in 1988, was involved in a contract dispute with the New Jersey Devils and, thus, made himself available for the Olympic cause the 1991-92 season. Finally, the number one overall selection of the 1991 National Hockey League, ERIC LINDROS, declared he would not sign for the Quebec Nordiques and instead decided to don the sweater for the national team to be competing in France that winter. Indeed, the Canadians enjoyed a good run at the Albertville Games; powered on offense by Boston Bruins draft pick JOE JUNEAU (6 go 9 as, 15 pts) as well as Lindros (5 go 6 as, 11 pts), Canada lost only once in reaching the Gold Medal Match. Unfortunately for the Canucks, they were paired with the Unified Team in the final, the same team who had defeated Canada previously. A two-time All-America at Renssaler Polytechnical Institute and 1988 4th round choice of the Boston Bruins (# 81 overall), it was JOE JUNEAU who topped the point-scoring chart at the 1992 Winter Olympic Games. 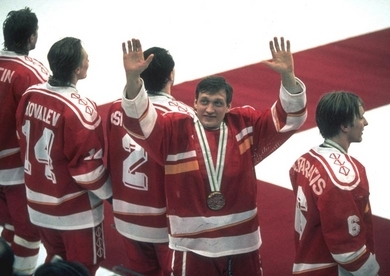 The Unified Team's EVGENY DAVYDOV, credited with being the first player off the bench at the infamous Piestany Punch-Up in 1987, waves to the crowd at the 1992 Winter Olympics in France. Three Unified Team players --- Davydov, Igor Kravchuk and Dmitri Mironov --- joined NHL clubs immediately after the Albertville Games. 20 of 23 Unified Team members ultimately skated in the National Hockey League. A referendum for the preservation of the Union of Soviet Socialist Republics was held in March of 1991 with nine of fifteen republics voting in favor of such. Before the New Union Treaty could be signed, however, hardline Communist Party members in the government and KGB staged an attempt to take power so as to reverse the reforms of Soviet leader MIKHAIL GORBACHEV in August. That same month, the republics of Estonia and Latvia declared their independence (joining Lithuania, who had done so in 1990). On December 8, 1991, the presidents of Belarus, Russia and Ukraine signed the BELAVEZHA ACCORDS. The Accords formally dissolved the Soviet Union and announced the COMMONWEALTH OF INDEPENDENT STATES would take its place. On December 21, 1991, delegates from all the former Soviet republics with the exception of Georgia signed the ALMA-ATA PROTOCOL, which basically confirmed the Belavezha Accords and addressed practical matters with respect to the dismemberment and dissolution of the Union of Soviet Socialist Republics. On Christmas Day of 1991, Gorbachev resigned as president of the USSR, declared the office no longer existed and then transferred all governing power to the president of Russia, BORIS YELTSIN. Exactly one day later, the highest governmental body of the USSR, the SUPREME SOVIET, officially dissolved itself. It is this date that historians typically mark as the formal end of the Union of Soviet Socialist Republics as a political state. Many of the former Soviet Union’s elite had already departed the disintegrating USSR for lucrative contracts with Western clubs long before the official end came. At the time of the Calgary Games four years previously, it had been projected that junior national team stars ALEXANDER MOGILNY, SERGEI FEDOROV and PAVEL BURE would constitute the next great troika to carry the Soviet Union in the 1990s. By the arrival of the Albertville Games, all three were already lacing their skates in the National Hockey League. In the off-season of 1989, Soviet hockey officials began to allow sizeable numbers of skaters to head West. Over the course of the next two seasons, 34 USSR national team players alone left the Soviet Union. To start the 1991-92 campaign, another 23 national team players took off including the likes of VALERY KAMENSKY, VLADIMIR KONSTANTINOV and VYACHESLAV KOZLOV. Long-time Soviet national team coach VIKTOR TIKHONOV still had enough talent left over in Feburary of 1992 to put together a typically-strong side, who competed under the moniker of ‘UNIFIED TEAM’ at Albertville. Only the CCCP logo was in absentia. The rest — the lipstick-red uniforms, the authoritarian coach as well as the high-calibre of skill — was still there. As were the results on the scoreboard. Old foe Czechoslovakia, at their final Olympic tournament as well, tripped the Unified Team 4-3 in the round-robin. Once the quarterfinal stage (appearing at the Winter Olympic Games for the first time ever) arrived, however, there was little doubt who the champion squad were. The Unified Team’s 3-1 victory over Canada in the first official Gold Medal Match simply certified such convictions. 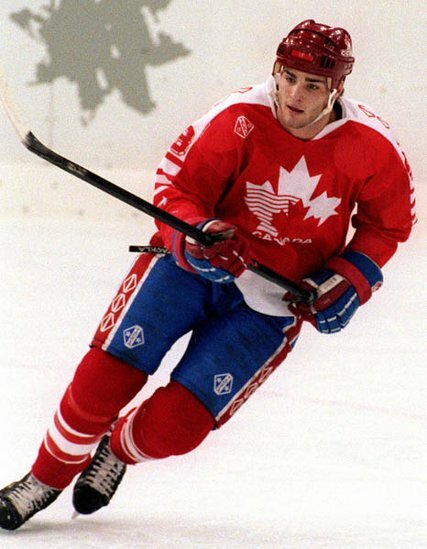 18-year-old ERIC LINDROS finished tied for fourth place in scoring at the 1992 Winter Olympic Games in Albertville, France, with 11 points (5 go 6 as) in eight games. 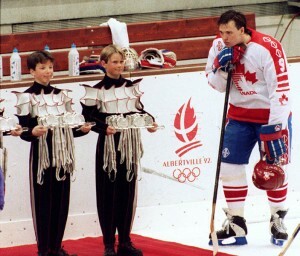 Lindros had been drafted number one overall by the Quebec Nordiques of the National Hockey League, but chose to compete for Canada at the Olympics instead and sparked controversy. The ice hockey competition was changed to a playoff-style, elimination format for medals from a quarterfinal stage onwards at the 1992 Winter Olympic Games at Albertville, France. Naturally, the very first round of knockout competition for medals at the Olympics necessitated a penalty shot shootout to determine a winner for one of the quarterfinal matches. CANADA and GERMANY made for ironic history-makers, however. Canada had arrived at the quarterfinals top-seeded from Group B with four wins and one loss in the preliminary round-robin; Germany finished fourth out of six teams in Group A with a record of two wins and three losses. Canada controlled play overall and outshot the Germans 36-21 for the contest but, critically, did have three goals disallowed by Finnish referee SEPPO MAKELA. In the third period, defenseman KEVIN DAHL’s deflected slapshot changes course a few times through the maze of players to intially put Canada ahead with six minutes to go in the game. But, Germany’s ERNST KOEPF of EC Koeln deflects a puck past Canada goalie SEAN BURKE to produce a 3-3 draw with 2:22 left. Of course, each team finished their guaranteed five shots with two goals apiece, JASON WOOLLEY’s shootout success not being shown on the clip presented. So, sudden-death for the shootout was required. Unlike at soccer’s World Cup, players who had shot before were permitted to try again. ERIC LINDROS (88), who failed on his first attempt, made the most of his second against German goaltender HELMUT DE RAAF. Needing a goal, Germany’s PETER DRAISAITL (20) sent a shot which somehow popped out the back of Burke’s pads. Bouncing on edge and rolling ever closer to the goal line, the puck flops and dies square on the goal line. The whole puck having not crossed the goal line — no goal signals the referee Makela. Canada advance to the semifinals; Germany are out. “That was the most dramatic finish I have ever seen to an international match,” German forward GEORG HOLZMANN was quoted as saying in the New York Times. The old CCCP logo was missing from the red sweaters but the same skill and proficiency at the game of ice hockey was still there. Less than two minutes remain in the Gold Medal Match at the 1992 Winter Olympic Games in Albertville, France, and the Canadians are desperate to level the score trailing by a single goal. After finally gaining control of the puck, Canada start up the left wing with ERIC LINDROS (88), the Quebec Nordiques’ number one overall selection at the 1991 National Hockey Leage Draft, in possesion. Just past the blueline, however, the big 18-year-old has his backhand pass broken up by another Quebec draft pick (1989, 9th round), Unified Team center VYACHESLAV BYKOV (27). Bykov’s goal caps a 3-1 victory for the Unified Team and continued Canada’s 40-year gold medal drought at the Winter Olympic Games.